Well, despite of being a bit athletic, right from my childhood, I had never thought of running in any long distance events other than just 400m or 800m events during the school days. But certainly, I wore my shoes for the first time for a long distance run in the Delhi Half Marathon 2006, and since then, I am in love with long distance running. 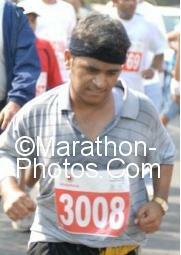 I am not that fast, nor am I a big time runner nor an athlete, but the spirit of running is the key driving force. 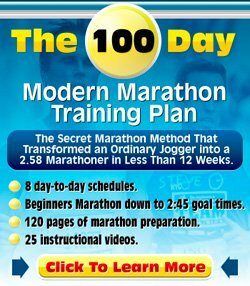 The Half Marathon and Marathon are categorized as extreme sports. So, definitely there's a joy in facing the challenge to its best, and testing the physical limits of your body during such a long distance running event. I never ran just to complete the race, rather to live the race. Well, the dream sprouted up in 2006, when I ran my first ever Half Marathon, to clash with the big guns more positively and with even high energy. But, the performance was a somewhat repeat telecast of 2006 in 2007. I already had struggled a lot during preparatory runs and suffered lots of cramps initially, but with time, got better and was in a position to run hard although I had a real shortage of time. The preparations of four months were all for the sake of Sunday, October 28th, 2007. Conditions, yet again, were against me, as I reached the venue at 0800 hrs instead of 0745 hrs and had to suffer a trail of those 15 minutes throughout the competition. I started off in very haphazard way as I ran (unofficially) from Moti Bagh to reach the starting line. With so much important energy and time skipped from my belt, I had a thirsty and quite a dull start. During the initial stages I was struggling my way through and at a point of time, it was clear that completing 21.097 km under 2 hrs would surely be a hard nut to crack. Quite awkward to say, but it is a fact that the first half of the event was more difficult than the rest. The crowd was as usually the most supporting and inspiring with their loud applauds and cheers. Thanks to them, as they worked as hard as the refreshers did during the difficult times. Running among the eminent personalities on the same track was a thought of pleasure and pride. As the time passed by, crossing the 7th and 8th km mark, I was totally into the situation now, and I was running at my best during that particular part. The crowd running along with us, was awesome and inspiring. In addition to it, those banners all over the place which said "If you think you cannot run, then stop thinking", were also inspiring. It was that line which kept the spirit alive for the whole time. After 14 km, terrible pain and cramps in muscles, extreme thirst and total loss of energy were quite genuine signs. Soon, I had my first energy drink and quickly realized that I was running really short of time. It was an important time to take a decision quickly, either to run hard or just jog down the track, as muscles seem to be injured. I preferred jogging for a few minutes and then running for the final 4 km. Then the big queues of chip refund and medal distribution added to that terrible condition. I quickly had the refreshments and made my way to collect the certificate. Eventually, there was some technical problem at that time, so we got our certificates a bit late (through courier). I couldn't convert my figures to a big win, but my friend, the genius, Mr Rajiv Virat, sweeped yet again and retained the title of champion for the third time in a row in the Wheel Chair event. He truly deserves a loud round of applause. Overall, just like the year before, the Vodafone Delhi Half Marathon, was nothing less than a festival, celebrated by not only Indians, but the world as whole. The feeling of being a part of such a prestigious international event is amazing and makes me feel proud. My deep hearted thanks to all the organizing team members, especially "Procam" as without them, the event wouldn't have been such a grand success. Secondly, I would like to express my sincere thanks to all the participant, who were the people on spotlight and made the event such a powerful one. I hope to see a real "Marathon" also being introduced in Delhi, just like the "Standard Chartered Mumbai Marathon" as the response from the Capital city is awesome, and Delhities really want to run. Next year I will definitely run the half marathon again to live the golden moments yet again and run for a noble cause and also for the grand reward of $25,000. Till then, don't dare put your shoes down, keep running!